What is the standard desk height for best posture and ergonomics? Home » Resources » What is the desk height for best posture and ergonomics? When it comes down to having better posture at your desk, you’ll want to understand the mechanics of having a good ergonomic setup, and knowing what an average desk height is. At the same time, you’ll need to be informed of the dangers of sitting down long term. 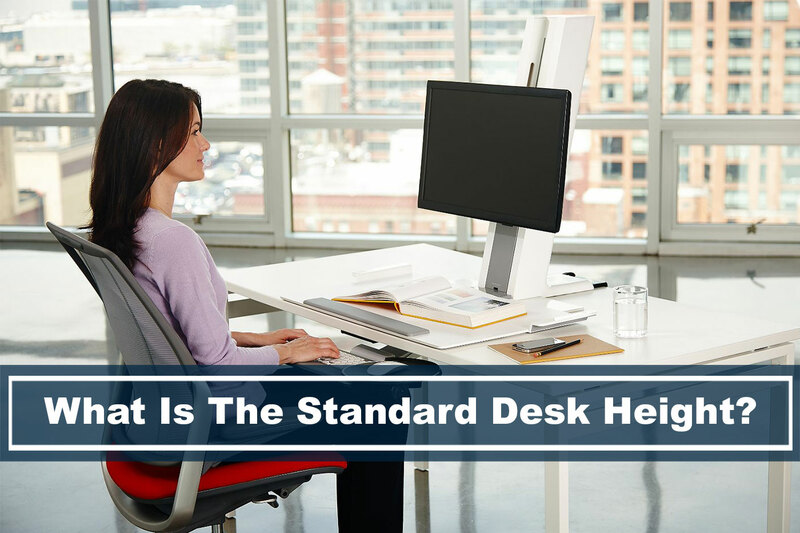 In this article, we’ll be going over some of the recommended standard desk heights for a wide range of users that are different in height. We’ve been getting requests on helping customers narrow down on their buying options due to their height. Chances are that you just have a regular desk size at your office. And by coming here, you’re one step closer to performing better at your work. Why knowing the average desk height matters? What if I have a keyboard tray? A normal desk, or “non-standing” desks you see often from Ikea, Office Depot, or similar office supply stores, are normally 29 inches tall, or 73.5 cm (approximately). Sometimes this desk height doesn’t work too well with people, especially those that are prone to back pain. Its always better to have options and find a desk that is user adjustable. Based on National Center of Health Statistics, the average height for male individual is 69.2 inches or 5 feet and 9.2 inches tall. For females, the average height is 63.7 inches or 5 feet and 3.7 inches tall. This means that most people deal with the standard 29 inch desk heights are either too tall for them or even too short, especially for those people taller than 6 feet. This could possibly be the reason why you may be dealing with ergonomic issues which leads to back pain or posture problems. The image has labels that correspond to the heading of the table. The columns are separated by Seated Position and Standing Position. 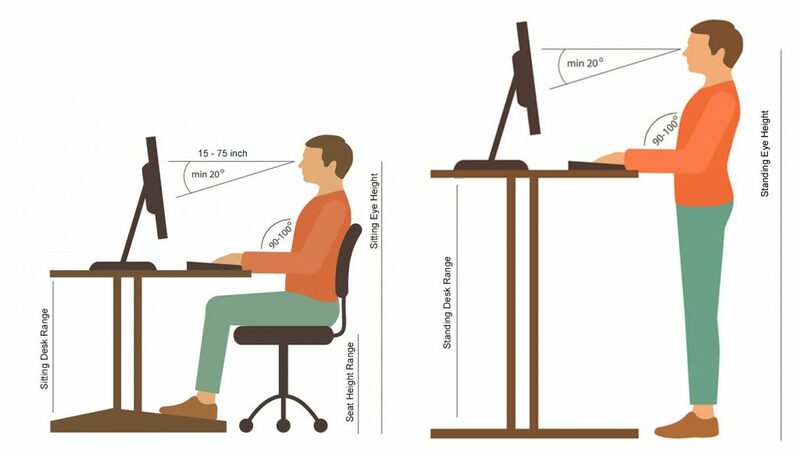 Each section is then separated by the three and two subcategories: Seat Height, Sitting Eye Height, Sitting Desk Range, Standing Eye Height, Standing Desk Height, respectively. This average desk height table was created to provide a general recommendation measurement for seated or standing. Please note that this information may not be accurate for everyone. We do encourage you to use a measuring tape to measure your current setup as a baseline tool, to see how you currently feel. If you do not have something to currently measure, then the table will be a good place to start. Most office chairs nowadays have the ability to adjust its height. However, standard chair height (non-adjustable) ones are about 18-inches, measured from the floor the seat. When it comes to finding the perfect ergonomic chair, you’ll want to make sure that your chair can be adjusted to your comfort, more than just adjusting its height. Some chairs will give you the ability to tilt, adjust its armrest, and also adjust the seat position itself. But when it comes to ergonomics, make sure that your chair height, table height, and elbow height are in unison. If you’re looking to buy a standard desk, then you might start developing back pain or health problems in the long run, especially for those that are at their desk the majority of the day. 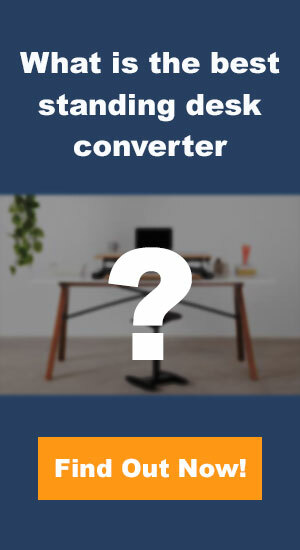 Our recommendation is to invest in an adjustable standing desk or standing desk converter because it gives you so much more flexibility and allows you to control the desk height. In the illustration above, you’ll be able to see the different average desk height that should be when standing up. Your elbows should be 90-degrees to the desktop or your keyboard, and your monitor is raised to eye level. There’s no real industry standard desk height for standing desks because these types of desks have a range of heights, giving you the flexibility to adjust per your comfort and height level. If you’re not interested in getting an adjustable desk, then the typical desk height is around 30-inches, measured from the floor to the tabletop. When it comes to finding the proper ergonomic, you’ll want to make sure that you have a good chair where the seat is adjustable to your height. In the illustration above, you’ll notice that your feet should be firmly placed on the floor and your thighs perpendicular to the floor. You shouldn’t raise your seat high where you’re “tippy-toeing,” nor too low where your thighs are at an angle. For the proper height of your chair, you’ll want to make sure that your knees are about 90 to about 97-degrees. Understanding these measurements can help with your ergonomics and help relieve any future pain that may come from bad posture. When you’re in a flow state, your mind can be very focused and you won’t be able to feel any problems with your body, so eventually, your body starts to hurt more as time goes on. Setting up the proper height for your desk, chair, and monitor allows your body to be in the correct position so you won’t be stressing out your muscles or joints. If you have a keyboard tray that’s below the desk surface, you’ll want to adjust it between 22-inches and 30-inches for a seated position. If you’re in a standing position, it should be 36 to 46.5 inches. Desk height should be at a good position where your arms are rested comfortably with your keyboard. You should also relax your shoulders, and let it “hang” naturally. Keyboard and mouse should be placed on the same level and close to each other. Your keyboard and mouse should be placed where your elbows are 90-degrees, allowing your elbows to rest on your chair’s armrest. When you’re typing or moving your mouse, your wrist should be straight to avoid any future pain. Monitor should be at eye level so you’re not stressing your neck by tilting it up or down when viewing. 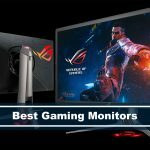 Monitors vary by size, and if it allows it, you should slightly tilt your monitor about 20-degrees (seen in illustration). Ensure there’s a safe distance so you won’t have eye strain, say a minimum of 15-inches away from you. For more tips, check out the in-depth article of an ergonomic setup.